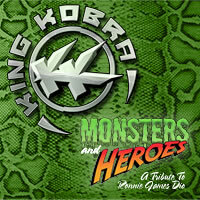 A brand new track "Monsters And Heroes" is out now from hard rockers King Kobra who will donate all the proceeds from its sale to the Ronnie James Dio Cancer Fund. Download the song now at www.carmineappice.net. King Kobra's excellent self titled new album is out on Frontiers Records on April 18th. Appice is now offering rare tracks and impossible to find, out of production albums available as digital downloads directly from www.carmineappice.net. Selections include "BBA (Beck, Bogert & Appice) Live in London", solo albums "Rockers" and "Party Tested", DNA (Derringer & Appice) and Mothers Army "Planet Earth".